The picture shows the building where the Lower Military Orphanage was maintained by the East India Company for the orphans of regular soldiers. 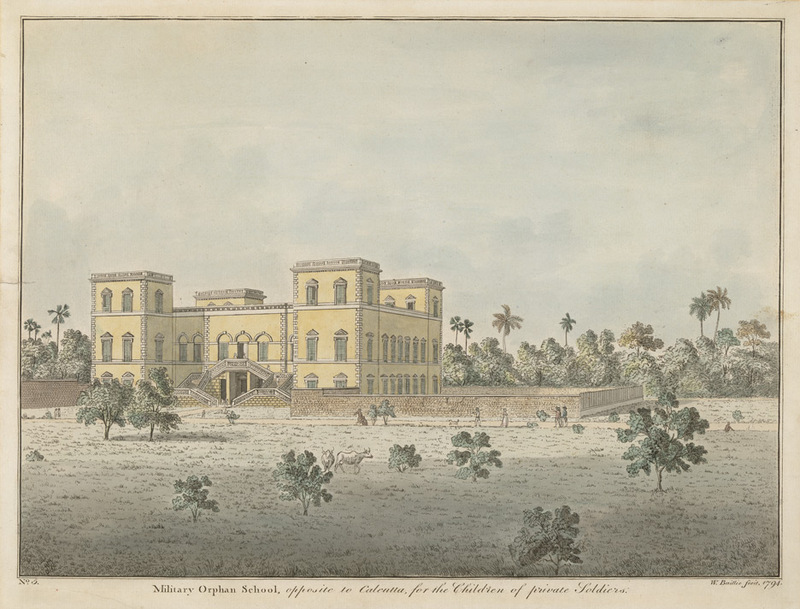 The Military Orphan School, which appears to have been the main institution for orphans in Bengal, was initially in Dakhineswar, later had moved to Howrah. This house, built by a Mr Levett in Howrah on the eastern bank of Hooghly River facing Calcutta, was originally meant for a distillery. In 1782 Captain William Kirkpatrick took over the house as an orphanage for the children of British soldiers of all ranks. Later in 1790 the children of officers were sent to a mansion in Kidderpore near Tolly’s Nullah, and the building pictured here became the Lower Military Orphanage and was maintained by the East India Company for the orphans of regular soldiers. This is a hand-coloured etching with aquatint by William Baillie (1752/3-1799) – plate five of his ‘Twelve views of Calcutta’ published in 1794. This entry was posted in Anglo Indian, Educational Institution, English Education, Primary Education, Welfare Institutions and tagged aquatint, Bengal Military Orphan Society, British Army, calcutta, Children, East India Company, Howrah, kidderpore, lower orphan school, military orphan school, orphan. school, r b hill, william baillie, William Kirkpatrick.